When we talk about Madden NFL 25 on the Playstation 4 and the Xbox One we have to include the Playstation 3, and Xbox 360 versions in the conversation. If you own Madden NFL 25 on the PS3 and/or Xbox 360 then you will probably not want to upgrade to the PS4 and/or Xbox One versions. We also need to address which is better - the Playstation 4 or the Xbox One. Family Friendly Gaming comes down on the Xbox One. The whole Smartglass thing is pretty neat. Not really needed, but a nice bonus extra feature if you can handle paying attention to multiple different screens at the same time. 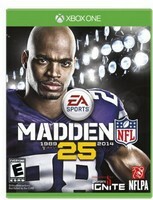 Family Friendly Gaming was provided the Xbox One version of Madden NFL 25, and that is what was used for this review. The first thing I noticed is how slick, and sleek this game is. I could go into it while it was being installed. That was a neat feature. I could only play the teams from the last Super Bowl, but still a neat feature. Madden NFL 25 is heavily into the online modes. I still have not broken down and created an Origin account. So that severely limits how much of this game I am able to access. I could not even find a regular season for the Seahawks outside of all the online modes. The presentation, and graphics have been improved in the Xbox One/PS4 versions of Madden NFL 25. I noticed the improvements to the presentation immediately. This game started us from one part of the stadium in the first game, to another part of the same stadium the next game. The announcers feel more natural and accurate in this version of Madden NFL 25. They go to a reporter to learn about injury updates. We can easily challenge plays, and run plays on the field. I ran into issues in two player games with knowing what play Madden suggested. Which makes implementing it more difficult. I am also not fond of having to tell the game I want to pick my very own play before each play begins. I wish Madden NFL 25 had kept me in my play selection. Madden NFL 25 automatically saves videos of good plays - like touchdowns to Upload. I have not figured out how to share those yet. Some of the touchdowns are pretty neat to watch again and again. Or at least I enjoy watching them again and again. The first time a franchise moves over to a new console there is a learning curve. Madden NFL 25 shows a lot of promise and potential on the next gen consoles. I expect the franchise to make leaps and bounds in terms of improvements next year. The improvements to the linemen are visible in this year's release.